Are you still consuming vegetable oil because you think it's healthy? Vegetable oils are highly processed. Not only are these oils heated and treated with industrial chemicals, they are also combined with toxic solvents. Watch the video here to see how canola oil is made. It's pretty gross. ​2. Vegetable oils are loaded with trans fats. Trans fats are unsaturated fats that are modified to be solid at room temperature. These fats are highly toxic and are associated with an increased risk of various diseases, like heart disease, cancer, diabetes and obesity. They are so bad that many governments around the world have started taking action by implementing laws demanding that food manufacturers reduce the trans fat content of their foods. ​3. Vegetable oils contain artificial antioxidants. Most vegetable oils and their products contain BHA and BHT (Butylated Hydroxyanisole and Butylated Hydroxytoluene) which are artificial antioxidants that help prevent food from oxidizing or spoiling too quickly. These chemicals have been shown to produce potential cancer causing compounds in the body and have also been linked to liver/kidney damage, immune problems, infertility or sterility, high cholesterol, and behavioral problems in children. ​4. 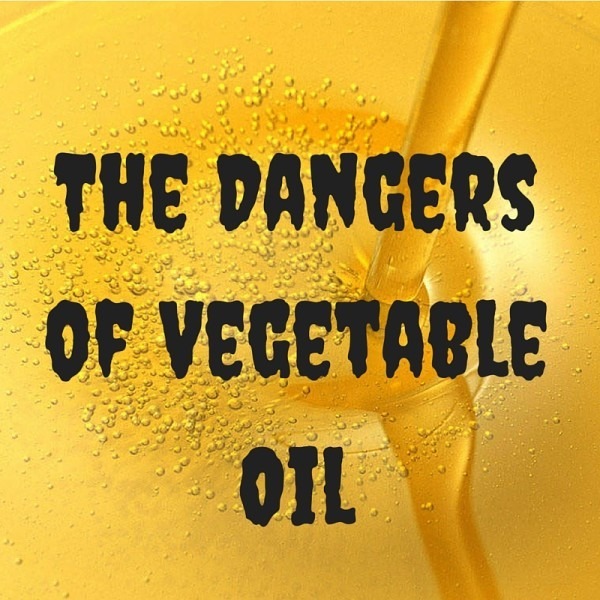 Vegetable oils interfere with the fatty acid composition of the body’s cells. There are two types of fatty acids that are termed “essential” – because the body can’t produce them. These are the Omega-3 and Omega-6 fatty acids. It is absolutely vital for the human body to get these fatty acids from the diet, but it must get them in a certain balance. While humans were evolving, our Omega-6:Omega-3 ratio may have been around 4:1 to 1:2. Today, our ratio is as high as 16:1 on average. When the balance of Omega-6s and Omega-3s in the cell is off, things can start to go wrong. Another problem is the relative unsaturation of these fatty acids. Polyunsaturated fats have two or more double bounds, while monounsaturated fats have one and saturated fats have no double bonds. The more double bonds in a fatty acid, the more reactive it is. Polyunsaturated fats tend to react with oxygen, which can cause chain reactions, damaging other structures and perhaps even vital structures like DNA. 5. Vegetable oils contribute to inflammation. Omega 3 and Omega 6 fatty acids are used to make substances known as eicosanoids in the body​. Essentially, these are modified fatty acids which sit in the cell membranes. They play a crucial bodily function including sending messages to the cells, inflammation as well as immunity. For example, if you've ever felt relief from a headache after taking an ibuprofen, that's because the ibuprofen inhibited the eicosanoid pathways and helped reduce the inflammation. While acute inflammation actually benefits the body and helps it to heal, chronic inflammation in the body is problematic. Eicosanoids made from Omega 6's are pro inflammatory and those made from Omega 3's are anti inflammatory. The key here is a balance between Omega 6's and Omega 3s. It is believed that chronic inflammation in the body may contribute to heart disease, arthritis, depression and even cancer. The more Omega 6s you have in your body, the more systematic inflammation you will have.